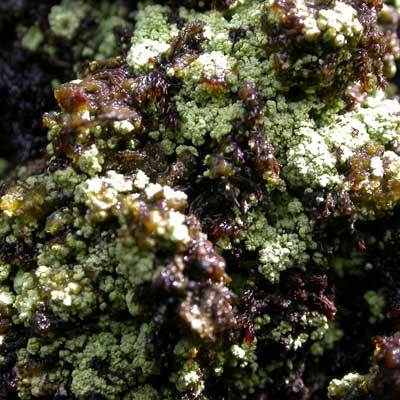 This is a lichen of upland areas where siliceous rocks, boulders and scree are regular features. 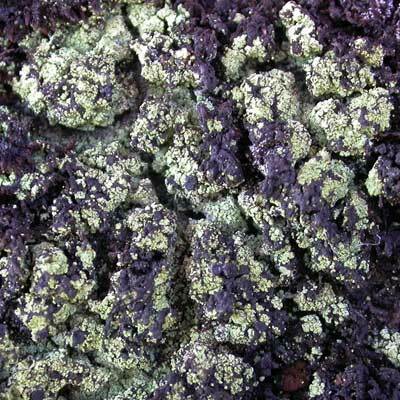 The green to lemon-yellowy crustose thallus overgrowing mosses or soily crevices will be quick to attract attention. These scattered crusts only a few centimetres across readily disintegrate into powdery soredia. The discs are black, lending it an appearance reminiscent of the ‘map lichen’ Rhizocarpon geographicum. It is frequent especially on rocks along stream corridors. Throughout Ireland. On acid, upland rocks especially outcrops in shady situations. Simms, M. J., (2016). Arthrorhaphis citrinella (Ach.) Poelt. [In] LichenIreland.